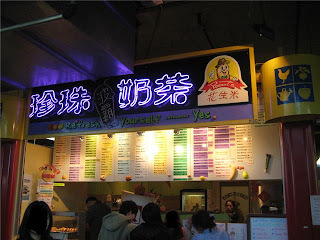 Specializes in bubble tea and “Che Lung Bing” – a Taiwanese “cookie” made out of a crepe and stuffed with your choice of custard/red bean/coconut/peanuts etc. I’ve been a loyal customer of Peanuts for at least 8+ years. They’ve only done renovations once since I’ve known them and they don’t need anymore operating space then what they have. They’re not pretentious and know what they’re good at which is the reason for their success. They do very well considering the location and set-up. It’s very popular to locals. They’re also popular because they use real fruit in their fruit flavoured bubble teas. You can also order yogurt based bubble teas where they make frozen yogurt with frozen fruit (just like Yogen Fruz) and mix it in your bubble tea. It’s great! My only complaint is that their pearls have gotten too soft over the last few years. I don’t know if they’re over cooking them or what. Not as much Matcha powder as Pearl Castle’s Matcha bubble tea. The one at Peanuts is a bit sweeter and the one at Pearl Castle has more of a bitter aftertaste, it’s also darker green because they there’s more powder. 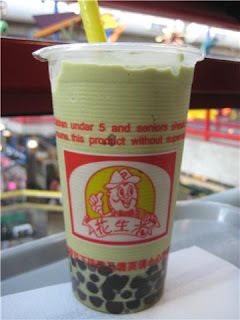 The one at Peanuts is very good, it’s almost like a green tea ice cream bubble tea, which is also available. Again the pearls were a little soft, but they give you a good amount. I love bubble tea and I'm fortunate to live just a short walk to a few good places =). The Che Lung Bing sounds delicious. Have you had it? Yes I have! I like the coconut, cream or peanut stuffed ones…they make them all day and you can watch them. I'll write a review for them next time. They're nice and warm, wrapped in this crepe like batter…they're the size of mini hockey pucks and really delicate in texture and flavour. They look like mini hockey pucks too actually. Thanks for commenting! If Babycakes was in Vancouver, BC it would 99% be located on Davie Street, everything about it screams and shouts Davie. It’s a cozy diner offering home made comfort food and they’re most famous for their creative cupcakes and fabulous atmosphere.